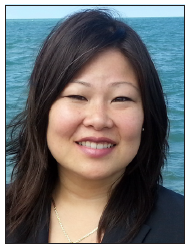 CHICAGO — “I think there is a great deal of significance for Asian Americans running for office, especially county-wide,” said Josina Morita, who recently came off of a hotly contested March 2014 election campaign for a seat on the Cook County Metropolitan Water Reclamation District board. Morita is a 33-year-old Gosei (fifth-generation) Japanese American and sixth-generation Chinese American who represents a new face and vision for Japanese American and Asian American political leadership in the greater Chicagoland area. It is a scene where Asian American elected officials remain vastly underrepresented, but are increasingly claiming a political voice in relation to their growing population. This relatively barren political landscape was a stark contrast to the vibrant Asian American milieu that Morita grew up in. Having been raised in a largely African American community in Oakland, Calif., her parents, early stalwarts in the Asian American Movement, exposed her to political activism from an early age. Her Japanese American family’s experiences being incarcerated during World War II played an important role in informing her motivations for being involved in community issues. On her mother’s side, her family was imprisoned in the Tule Lake concentration camp in California. 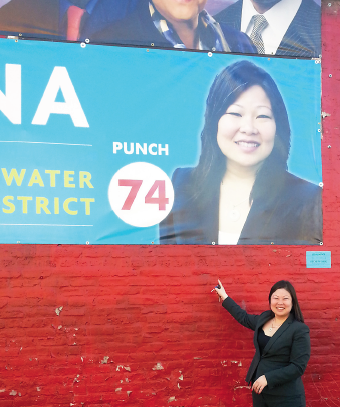 Josina Morita points to one of her campaign posters in Chicago. Her great-grandfather was wrongfully arrested in Seattle directly after the bombing of Pearl Harbor, and was held in a Department of Justice internment camp in Santa Fe, N.M. until close to the war’s end. The rest of his family was incarcerated in Poston, Ariz. Though often overlooked as an elected county position, the Metropolitan Water Reclamation District board represents a $1.2 billion agency that protects Lake Michigan and the Great Lakes, and deals with important issues of drinking water, sanitation, infrastructure equity, and water management. With Cook County covering a population of almost 5.2 million, this race affects more people than any congressional district in the U.S.
Morita received strong support from the Democratic Party and, unusually for a first-time candidate, a wide range of endorsements from media, labor, and political organizations. Despite these successes, running for this office held its own unique set of challenges. Note: Morita ended up placing fourth out of a field of ten candidates, garnering 14% of the total vote with a vote difference between her and the next closest winning candidate of 14,845 votes out of 403,497 total votes cast. In recent years, other Japanese American women have also run for office in both Chicago and Cook County. Most recently, Lori Yokoyama ran for but lost as a Republican for Cook County state’s attorney in November 2012. She also ran for 4th Ward alderman in February 2011, placing second out of a field of seven candidates with roughly 10% of the vote. Also in February 2011 Emily Stewart ran for 46th Ward alderman, placing third out of a field of 11 candidates with roughly 15% of the total vote cast.